I've been practicing my coloring on roses, using ProMarkers, or pencil, or charcoals, even pastel chalks. I'll be sharing more of those in the upcoming days but today I wanted to show you what I did with a combination of ProMarkers, gel pens, and water color pencils. 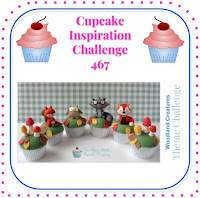 The image is from LeAnn's World 101. 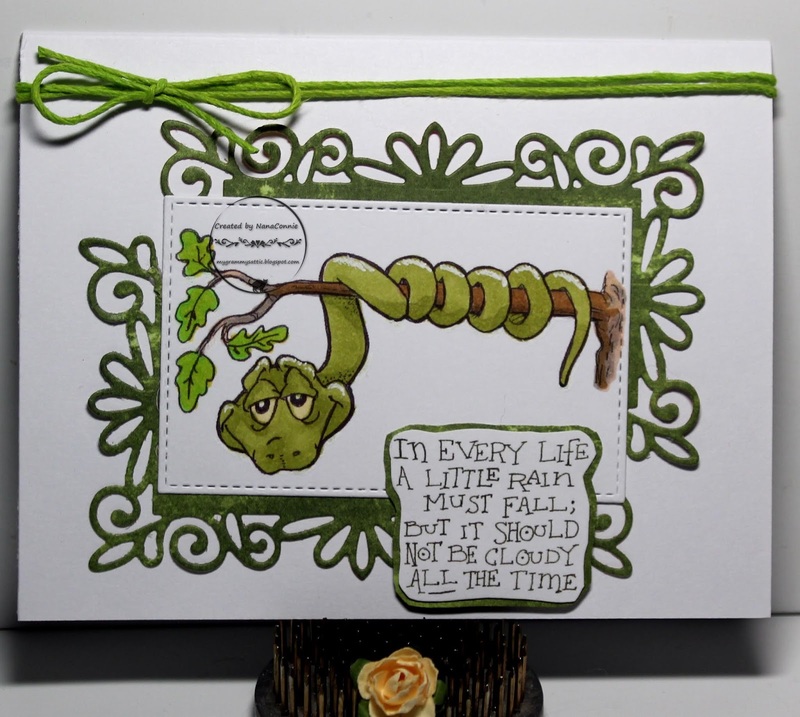 After coloring the image, I cut it with a stitched, scalloped die from Memory Box. 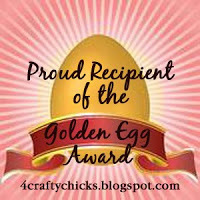 I used another, larger die from that set to cut the solid golden piece used as an offset mat. 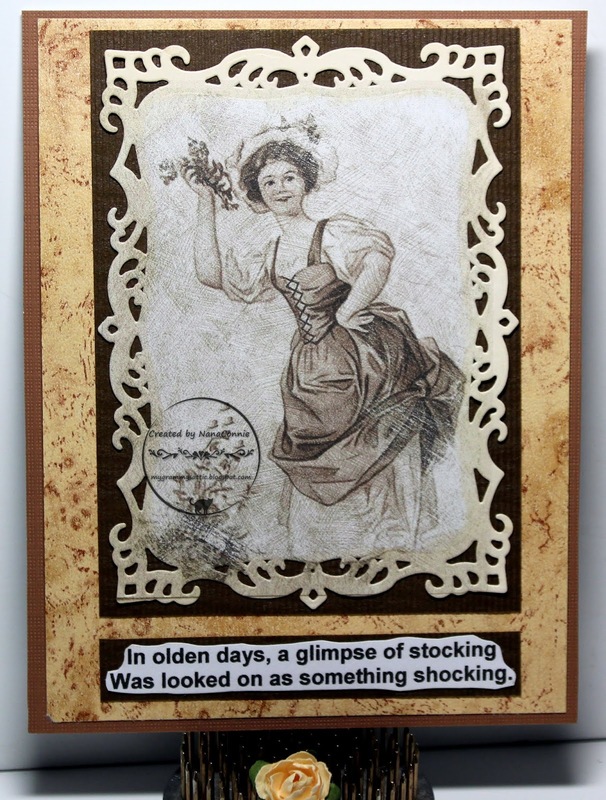 The 'damask' background is a scrap of DCWV dp and the stitched bronze ribbon was a scrap I found in my stash. I printed the sentiment and hand cut it before adhering it below the image. This one goes in my stash of birthday cards. Another "rain dance" card today, still hoping that we'll get another half inch or so before the dry days of summer set in. I love this darling little girl from Lemon Shortbread in her rain slicker and boots. I used the colors from My Favorite Things. She's been colored with ProMarkers, and cut with a scalloped die from QuicKutz. The sentiment was printed and also cut with a QuicKutz die. The flowers are die cut from mulberry paper (Spellbinders) and I added a tiny gem to the center of each. What you can't see is that the center flower has been glittered with loose glitter. I found two different satin ribbons in my stash of Crafty Ribbons, one white and the other light gray, and I layered them together before wrapping them around the suede cloth card front. This is the last of my suede cloth and that's a great excuse to go buy some more. 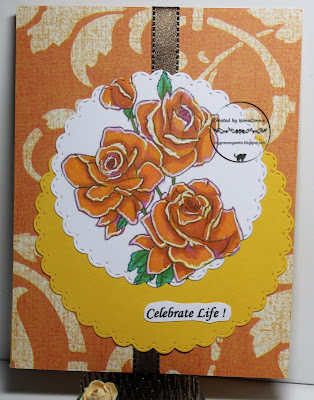 :-D It gives such a lovely texture to the card. Hey, did you know the Mo's Digital Pencil challenge was back? It's an "Anything Goes" theme with an optional twist of "Spring." This darling image (called Boo and Tulips) is an older one but you can still find it in the shop. It's perfect for a spring theme but could work for nearly anything. I'm using it for a birthday card for my SIL who has a May birthday and who loves kittens. 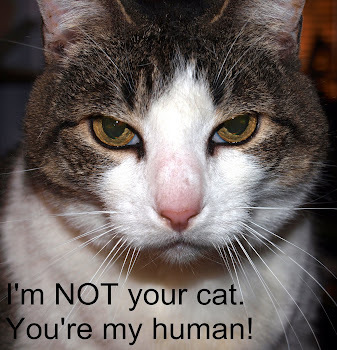 Even the briefest of glances around my blog sidebar will tell you that I love cats! I disagree with every person who says cats are aloof and unresponsive. I agree that some of them have "attitude" but it's the very thing I love most about them. I colored with ProMarkers, then used a Cottage Cutz die to cut out the image. I printed the sentiment and used another Cottage Cutz die to cut it. I had to adjust the placement of the die and cut twice to get the size and shape I needed but it worked. 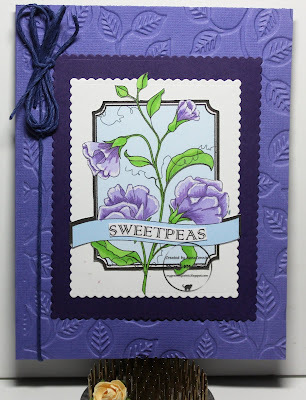 I found periwinkle CS to make the card base and ran the front side through my 'Linen' embossing folder. I wanted something really CAS so I adhered the image and the sentiment pieces and then left it totally alone - no embellishment at all. 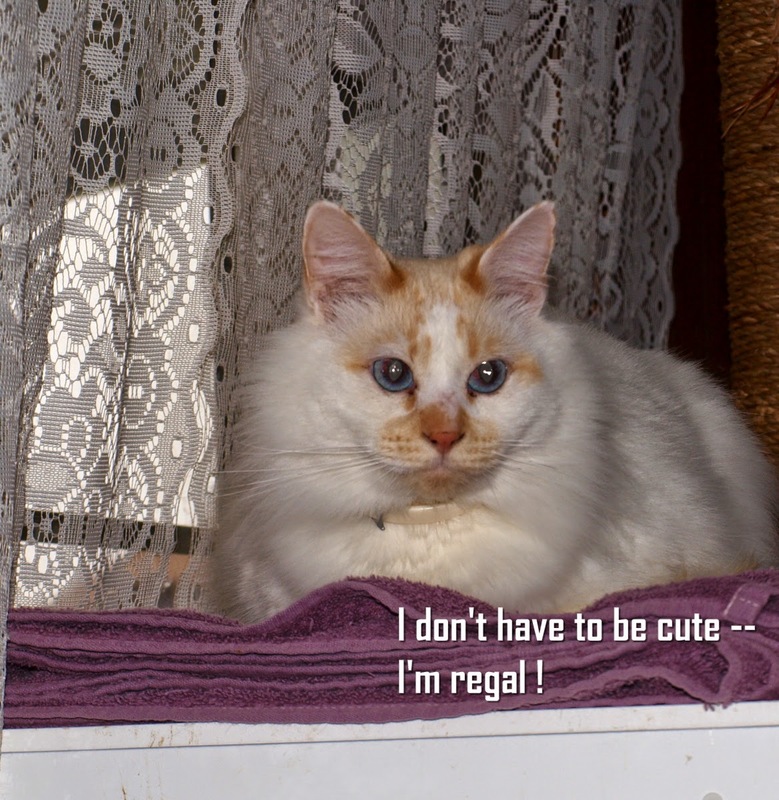 I'm sneaking this post onto the blog while the feline fur babies are distracted by my first post this morning which featured a kitten (at their insistence!) They don't much like it when I feature other animals, most especially dogs. On the other hand, who could resist this precious little pug? Let me tell you a quick back story about this card. My eldest granddaughter and her best friend have rented a house, each of them moving away from home on that "I'm now an adult" adventure. Her friend has a sweet little pug named Eva and, when I saw this image at Ching-Chou Kuik, I knew I had to do a card for her. I enlisted my granddaughter's help in getting a photo of Eva so that I could do the coloring to match her. Here's what she sent. 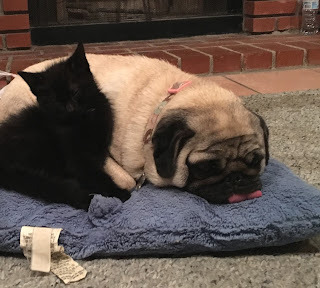 The little black kitten is Luna, a recent addition to the family and she immediately decided that Eva was her new momma. I used ProMarkers to color the image with added highlights done in gel ink. I cut the image, the mat for it, and the sentiment with Unbranded, cross stitch dies. Everything went onto a kraft card base. I added metal brads to upper and lower corners, then left it alone, adding no other embellishments. I wanted the image to be the focus of the card. I've been so steeped in Easter cards which feature bunnies and chicks, the fur babies were complaining that I wasn't giving felines a fair shake. 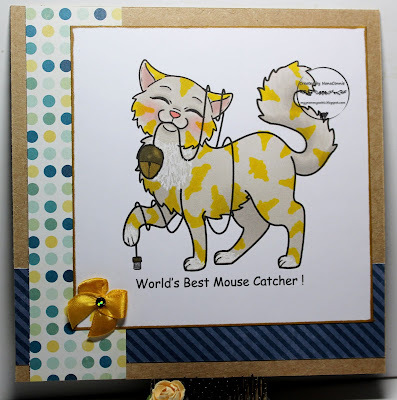 So, today I'm sharing a sweet little kitty from Di's Digi Designs. He seems completely absorbed in meeting a new friend while sharing his garden. I used ProMarkers to color, then cut with an octagon die from QuicKutz. I added the deep blue frame, also cut with another octagon die from that same set. The stitched ribbon is from my stash of Crafty Ribbons and the bow is one of my hand-sewn bows. It was white but I used ProMarkers to 'dye' it the color I wanted. I printed and hand cut the sentiment, then matted it and hand cut once again. I added no other embellishment because I wanted this one fairly CAS. I've been a Sparkle N Sprinkle customer since before I started blogging or got seriously into card making and I still love playing in their challenges. 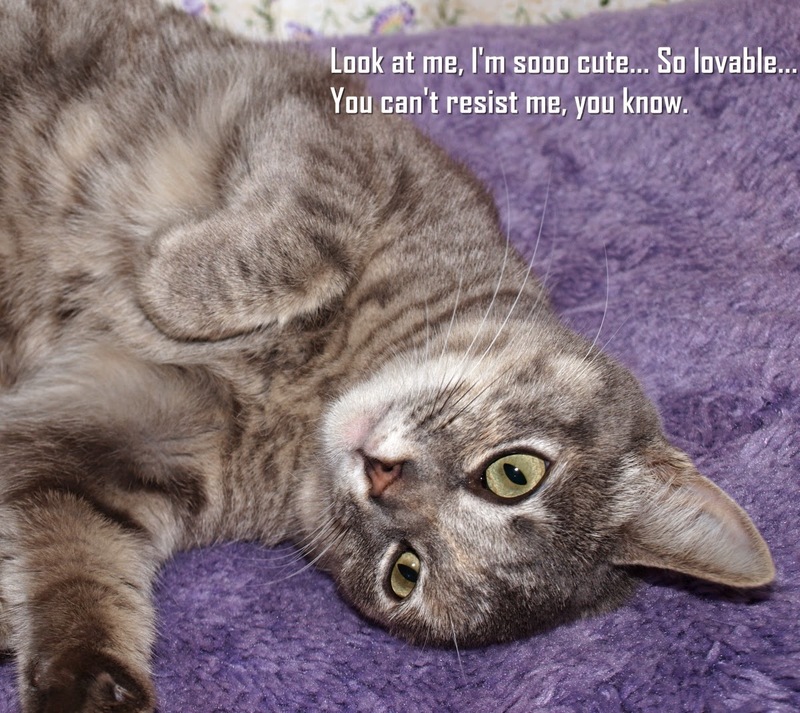 If you have even glanced at my sidebar, you know I'm a nut for cats. So, when I found this image in the SnS shop, I had to grab it up right away. I colored the cat with ProMarkers, adding a bit of white gel ink to the chest and paws. I die cut it with a plain but large, square die from QuicKutz. I inked the edges with a 'coffee' ink pad. 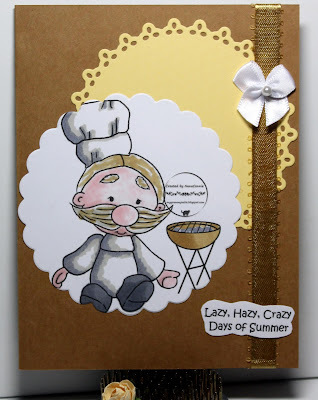 I made my card base with kraft CS, then added scraps of dp which came from Echo Park and Now & Then. I happen to love a combo of polka dots and stripes. The image piece went on top of that and my final touch was to add one of my signature, hand-sewn bows, this time with a sparkly gem instead of the usual pearl. I think this is simple enough to make a great masculine card. Where I live we had nearly twice as much rain in March as is normal but now into April, we've had no rain at all. Having had severe drought over the last 5 or 6 years, we really need more rain so I'm hoping for a few more April Showers. 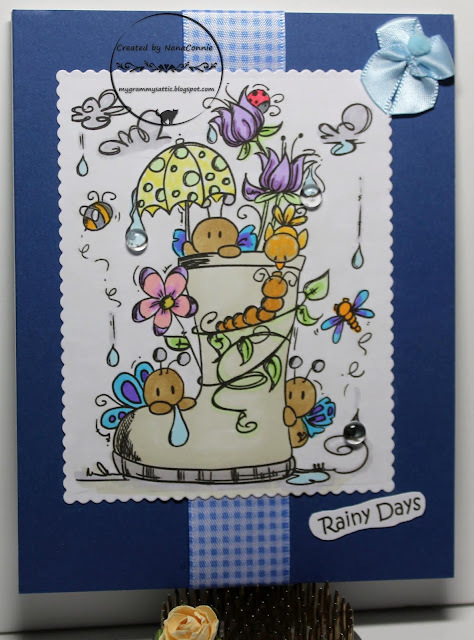 Maybe this card, featuring a darling image from Bugaboo Stamps, will help. Of course, I used ProMarkers to color the image (my go-to favorites!) 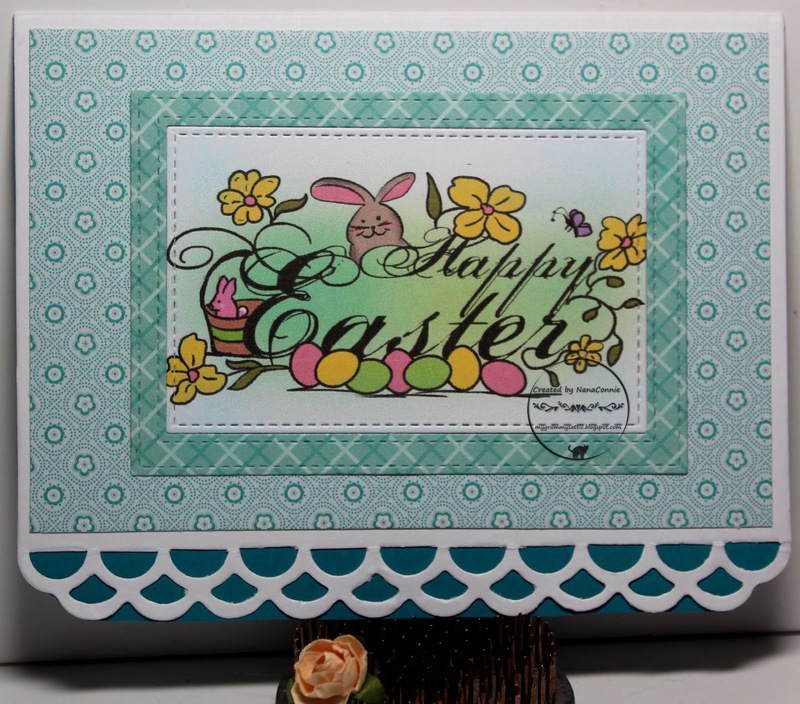 and then I cut it with a Tonic Studios scalloped die. I added some Dew Drops to a few of the raindrops in the image, enhancing the water aspect. 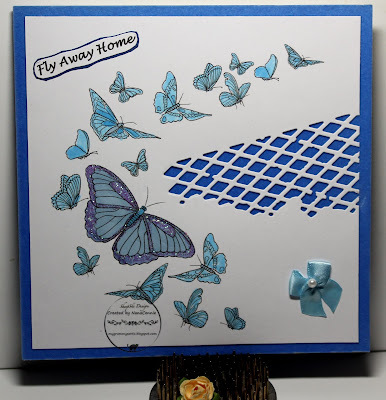 I found a denim blue card base and wrapped it with some gingham ribbon from Crafty Ribbons, adding the image piece on top of that. I did one of my signature, hand-sewn bows, shaping it to look like a butterfly to complement those in the image. I added a tiny pompom as the butterfly's head. Finally, I printed the sentiment and added it to the lower corner. 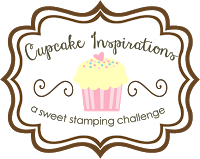 Friday morning and another weekly challenge is starting over at QKR Stampede. Our theme is always "Anything Goes." 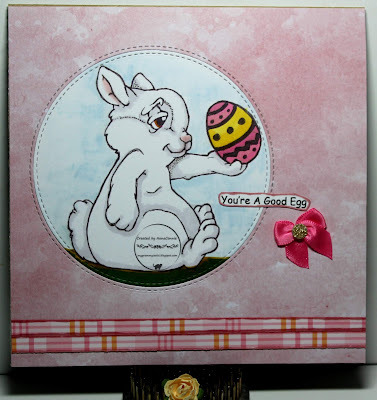 This week, I'm still doing Easter cards and I used this delightful QKR image called "Bunny and Egg." I colored the image with ProMarkers, then cut it with a Double-stitched Circle, Die-namics die from My Favorite Things. I also cut the dp with that same die. Notice the stitching on both the image edge and the dp circle? The die is double stitched to give that effect when the die cuts are inlaid. I printed and hand cut the sentiment, adding the plaid at the bottom of the card front, and finally tied a small bow using satin ribbon. I added glitter to a medium Pop Dot and stuck it onto the bow for a teeny bit of sparkle. This month she gave us a Tic Tac Toe twist and I've used the right hand column: Twine/ Flowers/ Embossing. I love these sweet peas and this time I started with a pre-colored image. Before I printed it, I used tools in Word to lighten the image, making the background around the flower a softer and more pale blue. Then, I used ProMarkers to intensify the sweet pea colors, plus pencils and gel inks to add highlights and shading to the petals and leaves. The "Sweetpeas" sentiment is part of the image set and I printed it, then trimmed it to fit the banner space in the image. 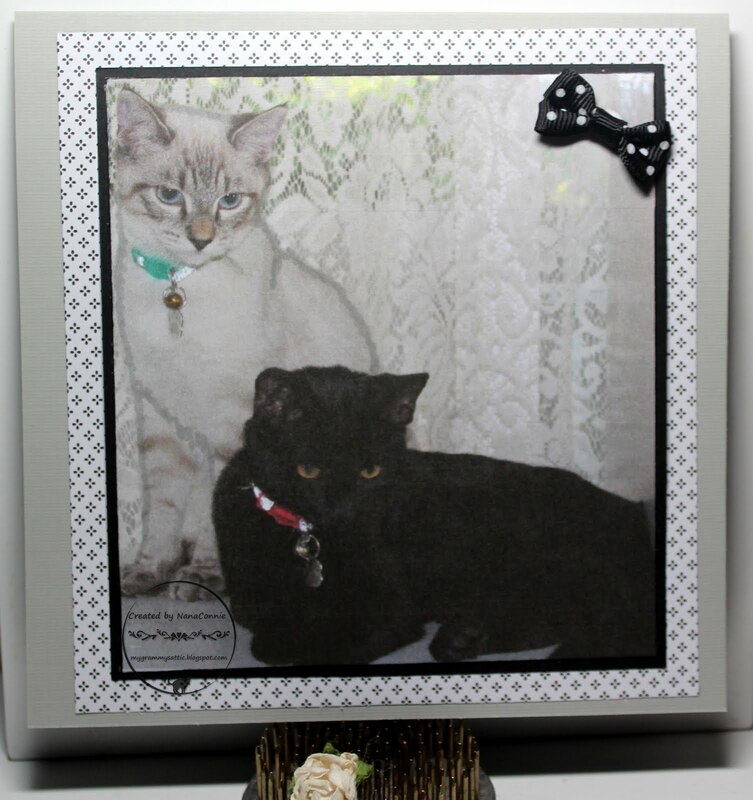 I fussy cut the image, then layered it onto a piece of white CS which I had cut with a Tonic Studios die. 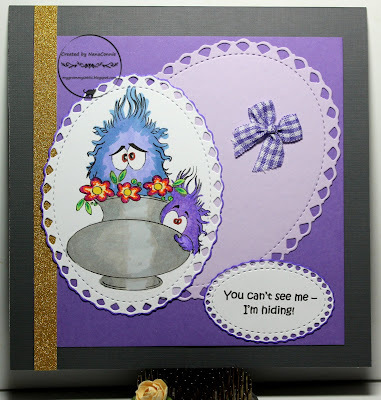 The deep purple frame was cut with another, larger, Tonic Studios die from the same set. I double embossed the card front. 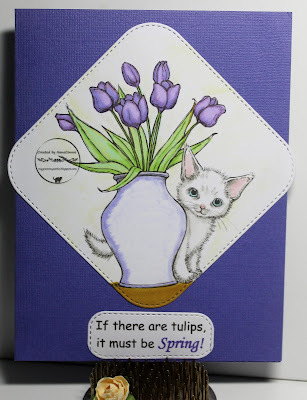 I started with periwinkle CS, embossed the front of it with my 'Linen' folder, then used a Sizzix 'Leaves' folder to emboss right over the 'Linen" embossing. The spaces between the leaves still shows the 'Linen' embossing. I layered everything together and added the jute cord twine and bow. Did you know that when monsters hide (in the closet, under the bed, behind the flower pot), they can't be seen? It's true! Check this out. 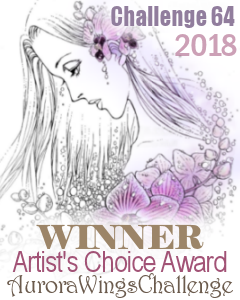 This image is for the April Progressive Challenge at Sasayaki Glitter and I colored it with watercolors, then used gel inks on the flowers and eyes. I did all the die cuts with Unbranded dies. The little plaid bow is actually made from a strip of fabric. I added the glittered ribbon for just a touch of sparkle. Today I want to share some of my oldest images which came from the now closed "Clearly Digital Stamps" store and they are both perfect for Easter. I combined the two images by hand this time because I wanted to run the ribbon between them. I colored the rose with ProMarkers and used colored pencils and gamsol on the rest of the sentiment piece. 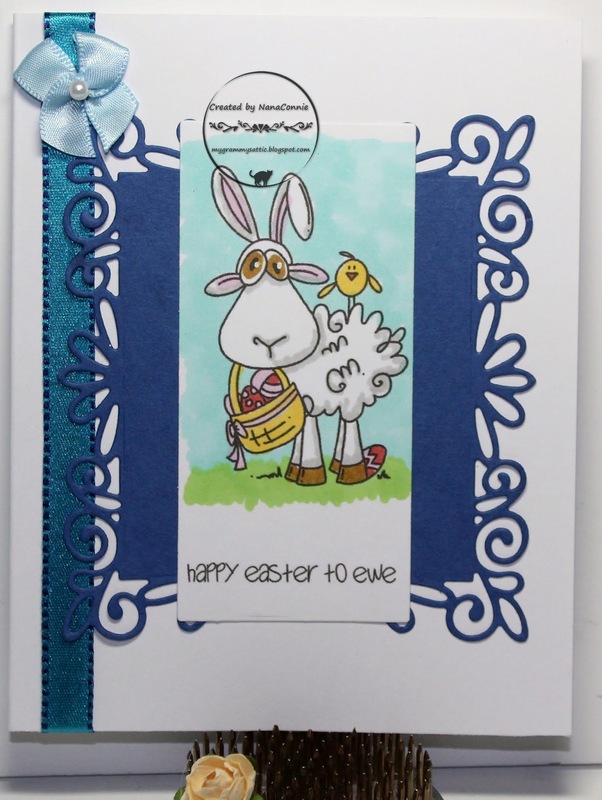 I left the Bible white and added the "Easter Blessings" sentiment to it. I fussy cut both pieces. I had that scrap of green dp which had been cut along the border with a die from Spellbinders. I trimmed it to fit the card front, ran it through an embossing folder (sorry, I don't remember the name), and adhered it, purposely leaving some white along the cut edge. I played around with how to layer things together, including the green satin ribbon, and finally decided I like this layout design the best. I tied a bow from a scrap of matching ribbon and called it finished. 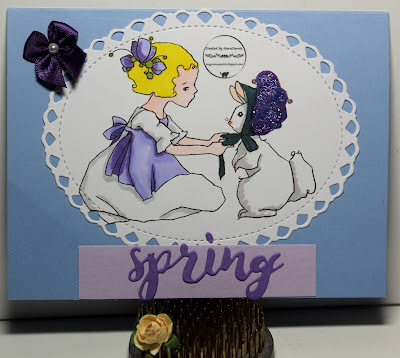 I found this darling image in my collection of A Day for Daisies digis and thought it needed to be on a spring card. What a fun idea - a bunny wearing her new spring bonnet! I colored with ProMarkers, adding glitter to the bonnet, then cut the image with an Unbranded oval die. The bonnet in the image isn't actually that shape but I cut a tiny scrap with a very small scalloped die (Spellbinders), covered it with glitter, and adhered it onto the bonnet, giving the piece some great texture and sparkle. I found two scraps, one of pale lavender and the other of purple CS, on my desk. 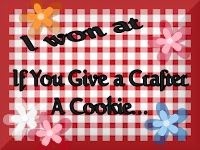 One I trimmed into a simple rectangle and the other I cut into the sentiment with a die from CUTplorations. 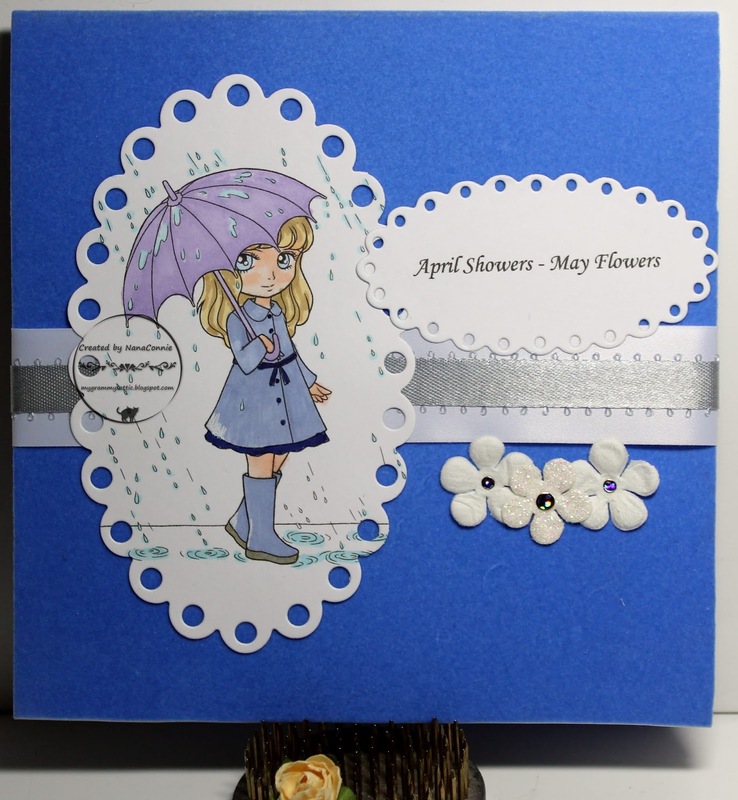 I added all the elements to a light blue card front and chose one of my signature bows as embellishment. I started by coloring the image with ProMarkers and pencils, then I cut it with a die from QuicKutz. The frame behind it was cut from blue CS with a Sue Wilson die. Because the die cut was narrower than what I wanted, I cut it in the middle (lengthwise) and attached one half to each side of my image rectangle. I wrapped stitched, satin ribbon around the card front, added the framed image, and then used one of my signature, hand-sewn bows with a pearl. Quick and easy design but the fancy frame makes it look much more complex. Another of my favorite progressive challenges, one I've been entering each and every month since they started it almost 4 1/2 years ago, Outlawz Progressive. 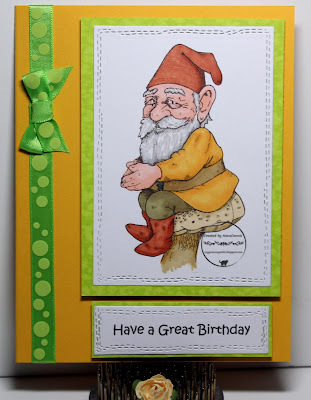 This month, Oddball Art has supplied the image for us to use and I turned it into a birthday card. I colored with ProMarkers, then cut the image and both frames with simple rectangle dies from QuicKutz. The background dp was a scrap that was on my desk and I think it was from Doodlebug. I trimmed it to fit the card front. The little bit of white ribbon was also a scrap on my desk and I saw no point in tossing it out when it fit perfectly here. I printed the sentiment, hand cut it, inked the edge, and layered it onto the ribbon strip. I added one of my signature, hand-tied bows to which I added a flat gem. I colored him with ProMarkers and watercolor pencils, then cut him with a stitched die from CUTplorations. I matted him with a scrap of bleached, green CS. I did the bleaching on that myself, using a Q-tip and 'dotting' spots, then letting it dry. I got on a huge kick of that a few years back and did probably 50 sheets of CS in different colors. Some of those sheets I still have in my stash. Because it's so time consuming to make, I keep every little scrap and try to use it up. I cut the sentiment with the same CUTplorations die, but I adjusted the placement of the die and cut it twice to get the size I wanted. The polka dot ribbon was in my stash and I used a separate scrap to tie the bow. I added everything to a golden yellow background, putting the image and sentiment on Pop Dots for some dimension. 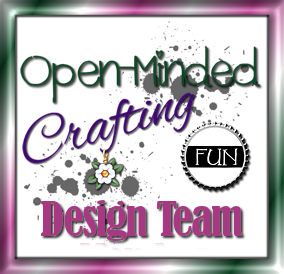 Here we are on the fist Thursday of a new month and that means a new challenge is starting over at Crafting with an Attitude. 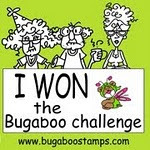 As always, our theme is "Anything goes" and this month our sponsor is Bugaboo Stamps. Did you ever think when you were hunting for all the eggs hidden by the Easter Bunny that some of them might hatch? 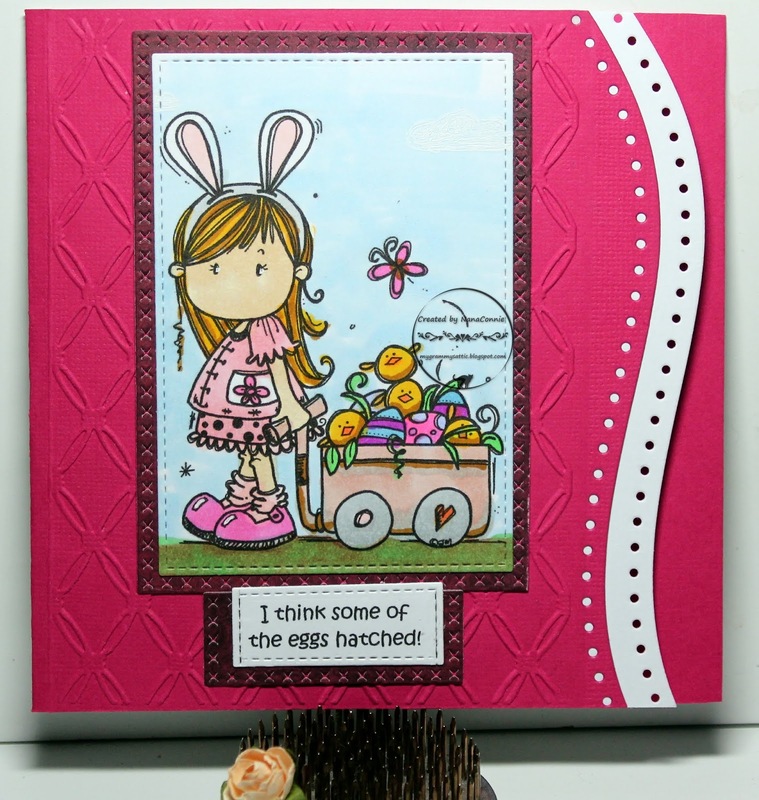 I think that's what happened to this little gal as she was putting all her eggs into her garden wagon. Now she has a garden blooming with chicks and eggs! :-D You can find her by clicking HERE. Over the weekend, I was visiting the Playground at Pixie's Crafty Workshop and found this post by Di, in which she describes the steps she took to get a perfect line up of striped paper die cuts and scraps. I was so fascinated by her technique, I knew I had to try it. Take the time to go and read her post. The bold words up above are a link which will take you directly there. I'm not going to try to describe each step here when she's done such a great job of explaining the step-by-step. Thanks, Di!! I woke up super early this morning and had empty time on my hands so I grabbed a patterned paper scrap (DCWV), some dies, and my Cuttlebug. In under half an hour, this is what I had ! 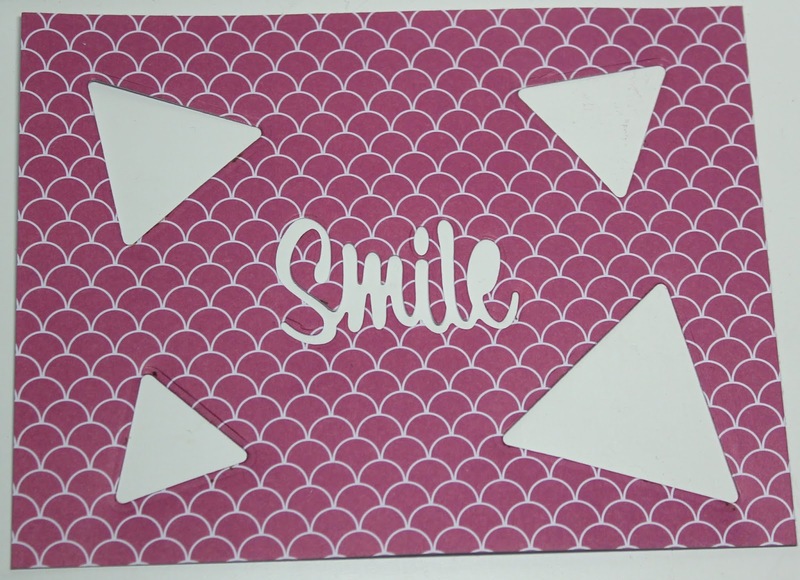 I know the pattern in the paper triangles doesn't look straight but here's the scrap I cut and you can see the perfect way everything lines up when the pieces are laid into the background CS. Dies for cutting the triangles are from a set by Memory Box and the "Smile" die is from Penny Black. 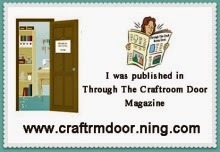 Today I have the honor of being a Guest Designer at Through the Craft Room Door. Their theme is always "Anything Goes" and I decided on something for Easter. 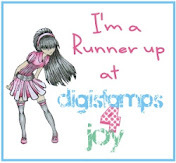 Over the years, I've given up most of my rubber stamps, changing primarily to digital images because they require so little storage space. I did keep this rubber Easter stamp (Bankes Vintage Stamps), mostly because I love the vintage aspect, and how it can look 'lineless' if stamped with light ink. I used an ink pad called "Old Photo," a pale, sepia-brown ink. 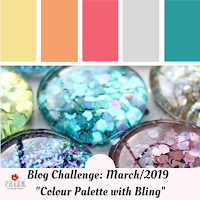 I was inspired by the colors at Prika Crafts. 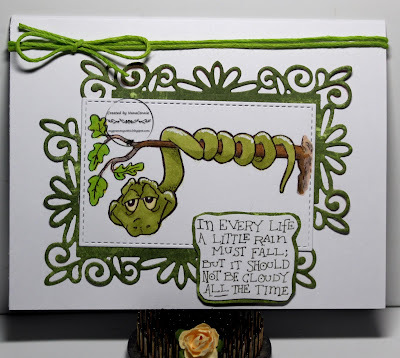 The leafy vines were cut with a Cheery Lynn die and the mulberry paper flower was cut with a die from Spellbinders. I added glitter to the flower petals and a gem stone to the center. Everything was mounted onto an aqua card base. New challenge today at SheepSki Designs and our theme is "Wings." What's more spring-like than butterfly wings? This delightful SheepSki image is called "Butterfly Curl." I colored all the butterflies with ProMarkers, then added loose glitter (Sparkle n Sprinkle "Azul") to the wings of the largest butterfly. The lattice work was cut with a Memory Box die. I printed and handcut the sentiment, inked the edges, and added it to the top corner. The blue background is actually a scrap of suede cloth, trimmed to size for the card front. It gives a soft, fuzzy look and feel to the card. I added one of my signature, hand-sewn bows to the lower corner because the shape of it mimics a butterfly and is a perfect complement. 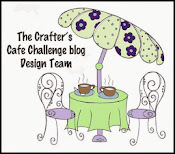 The April challenge has started over at 2 Crafty Critter Crazies (no April Fool gag!) 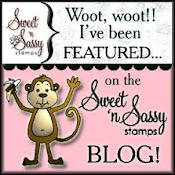 and our theme (as always) is Anything Goes with a Critter featured. Our delightful sponsor this month is Digi Doodle Studios. 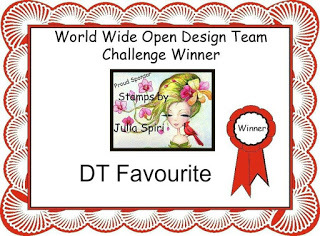 Although they generously supplied the DT with images to use, I chose one I already had in my collection, called "Kitty." 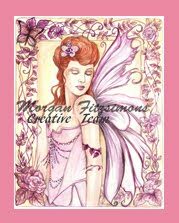 I used ProMarkers, chalks, and gel inks to color the image, then cut it with a die from Sizzix. I printed and cut the sentiment with a die from QuicKutz. I used a larger Sizzix die to cut the mulberry paper, then dampened the edge and 'feathered' it. The satin ribbon was the last piece of it I had in my stash and I wrapped it around the card front. I used my bow maker to tie the double layer, bow tie bow, using gingham ribbon. It's Friday again so that means it's time for a new challenge at QKR Stampede. We always have a theme of "Anything Goes" so there's no reason for you not to enter. You could win some fun and funny images from QKR Stampede. The one I used today is called "Wrapped Up" and the sentiment is called "A Little Rain." I'm sure this little snake would adopt that sentiment as his life's philosophy! After all, there's probably nothing nastier than trying to navigate across wet and slippery tree branches. 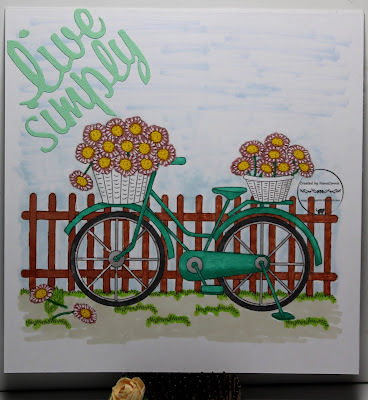 I colored with ProMarkers (my absolute favorites for coloring because I love the way alcohol ink blends), then cut the image with a stitched die from My Favorite Things - Die-namics. The background pieces are cut with a die from Sue Wilson. I cut two and offset them behind the image because the cut pieces were too small for just one to frame the image. One more way to make my smaller dies more flexible. 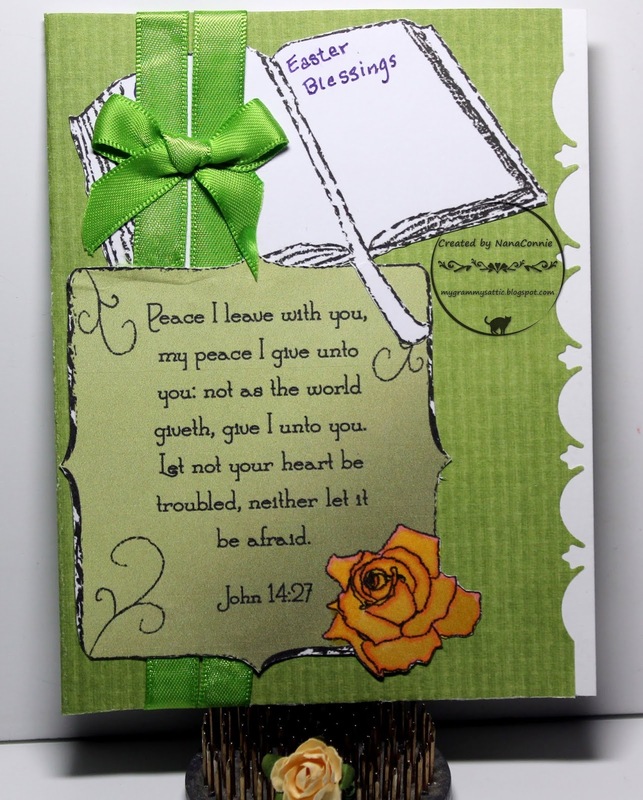 I added green jute cord, wrapped around the card front, then tied into a bow. 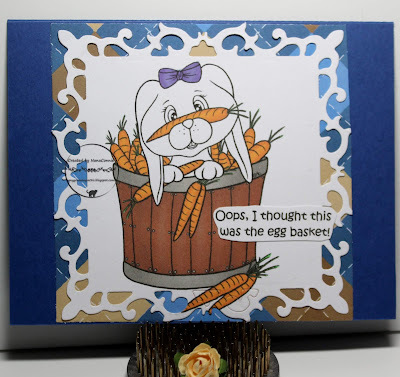 I colored with ProMarkers, then cut the image with a Sizzix die. The pale yellow circle was cut with a die from QuicKutz. The sentiment was printed and hand cut. I found a bit of golden, satin ribbon in my stash and wrapped it around the kraft CS front. I used one of my signature bows, leaving it white this time, and added only a pearl as I was sewing it. 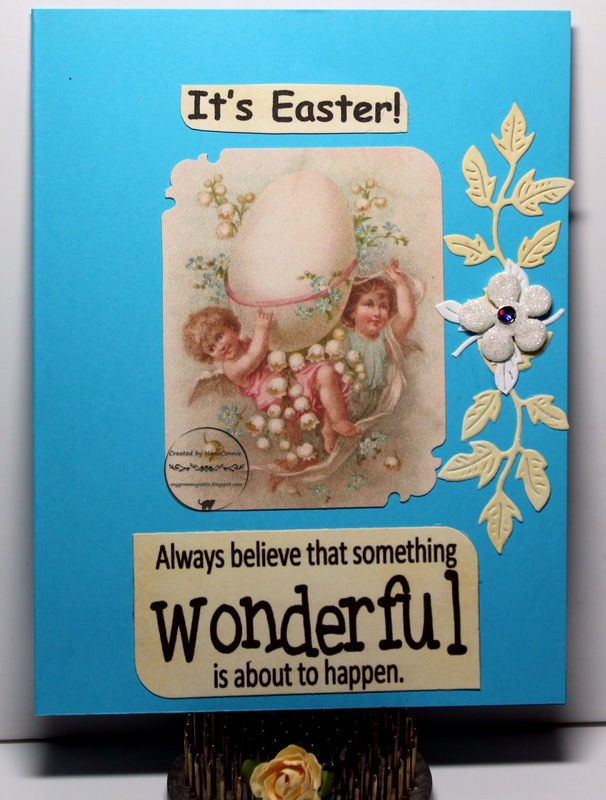 I'm still working on all the Easter cards I need for next month and this one has a sweet image and sentiment combo which came from Limited Runs. 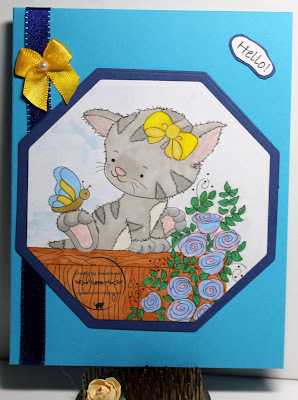 Colored with chalks and cut with stitched dies from Die-namics by My Favorite Things. 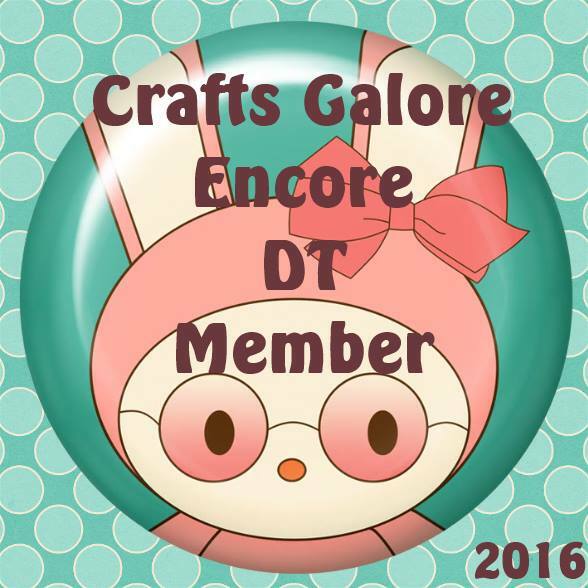 The border cut was done with a Cheery Lynn die. 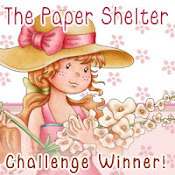 Papers are from Doodlebug and DCWV. I adore the image at the Progressive Challenge for LeAnn's World 101 this month, which you'll find on their FB page. It reminds me of how wonderful it can be to just live simply. 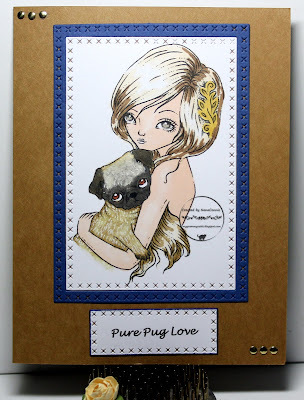 This is a one layer card and I printed the image right onto the card front, then colored with my ProMarkers, adding a few highlights with white gel pen. 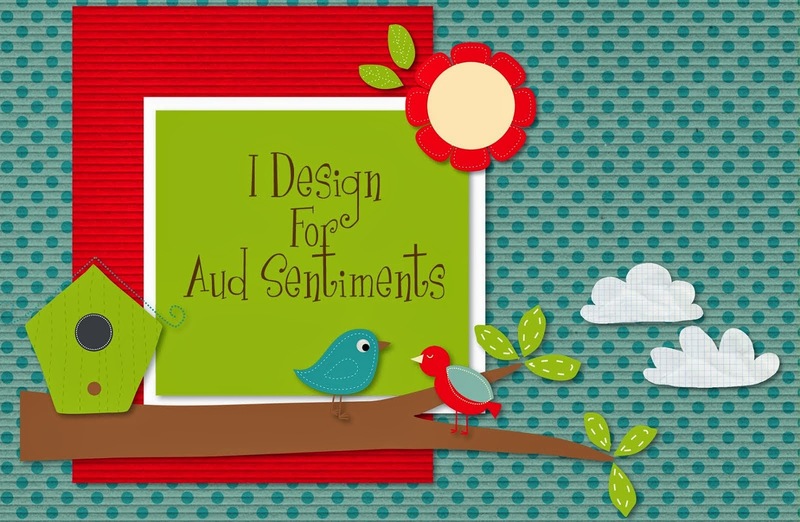 The die cut sentiment was made with a die from Die-versions. The original sentiment was inside a circle but I cut that away and used just the words. No embellishments because I wanted this to be very CAS in keeping with the sentiment. Today I have the honor of being an invited Guest Designer for the Songs and Lyrics challenge at The Outlawz. Every fortnight they choose a new set of lyrics to use as their challenge theme and the lyrics for today are from the old song "Anything Goes." Yes, after all of that, all it means is that the theme is "Anything Goes" but I decided to try something that fit in with the lyrics. I found this digital image over at TLC Creations. I printed out the image, enhancing the sepia tone with tools in Word, then cut the image with a die from Spellbinders. Once it was cut, I used Ivory and Vanilla ProMarkers to color the frame parts of the die cut, leaving the image itself in sepia. I added a dark brown mat to it which had been embossed with my ScorPal and stylus to add a bit of texture. Unfortunately, it doesn't show up that well in the photo but if you look at the very top of the brown piece, you can see how close I put the score lines. I printed the lyrics, cut out the first two lines and used those for the sentiment. 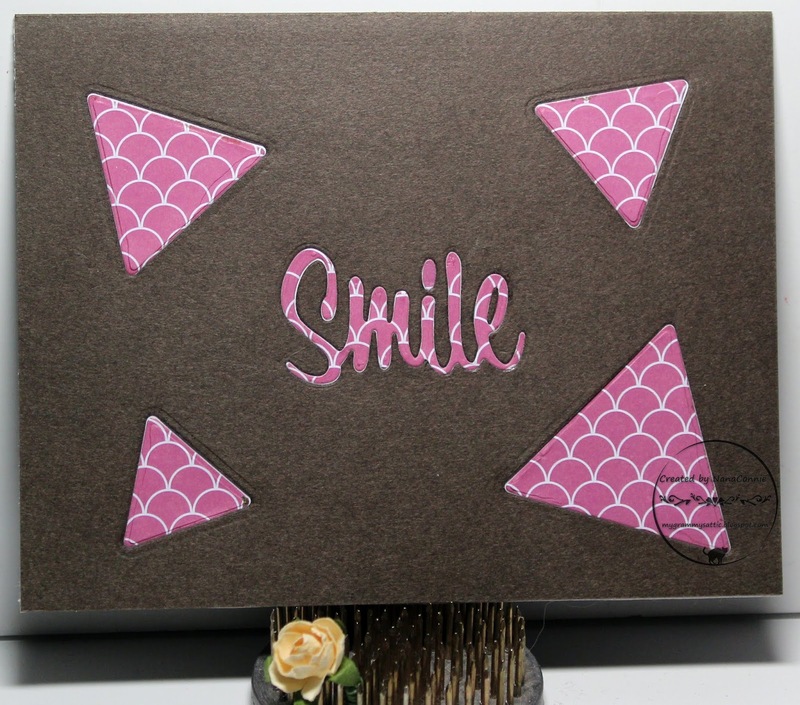 The background piece is paper-thin cork and everything is mounted onto a light brown card base. The image is an old one from Beary Wishes, which I think is now closed. I colored it with ProMarkers, then die cut the image with a die from Spellbinders. The plaid scrap was cut with a die from QuicKutz. 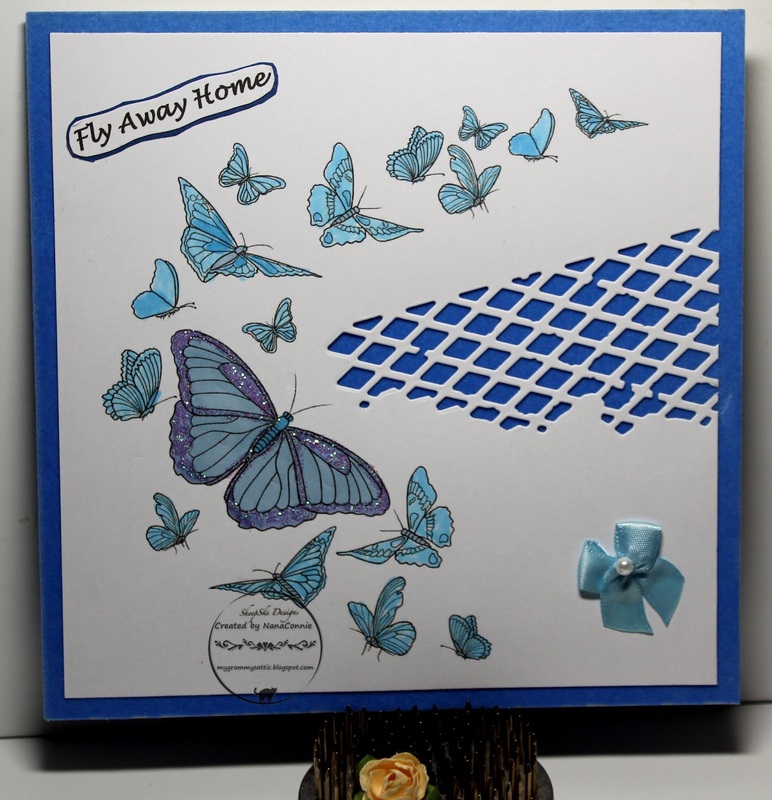 Everything went onto a deep, blue, card base. I knew this was going to be used as an Easter card for a boy so I kept it simple and unembellished, letting the paper and die cut give all the visual interest.